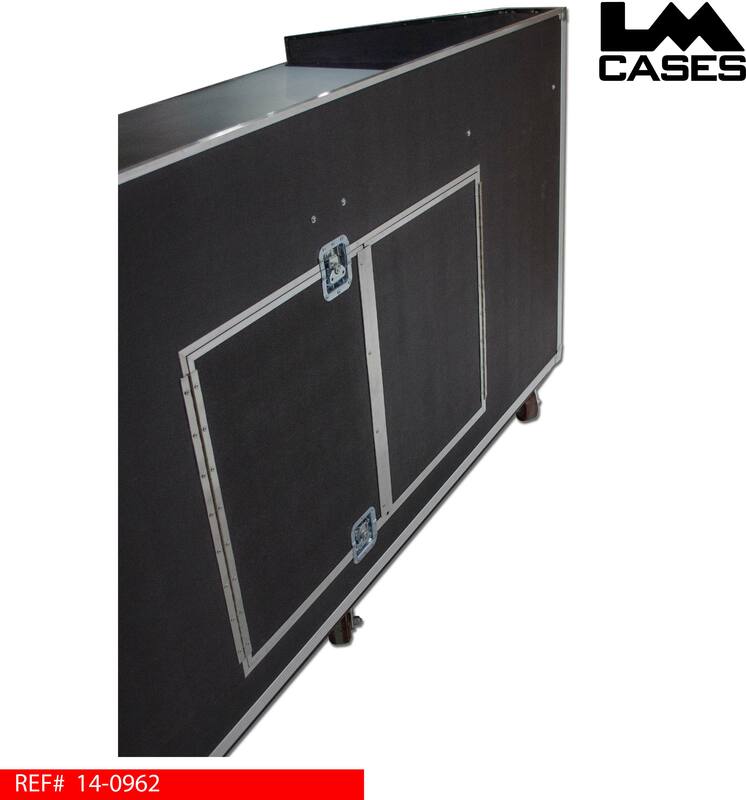 This case was designed for Advanced Lighting & Sound as installed workstation for a portable church. 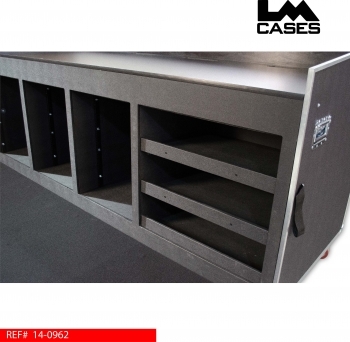 The workstation accommodates an audio and lighting console as well as provides storage for all of the church's technical equipment including mics and cables. 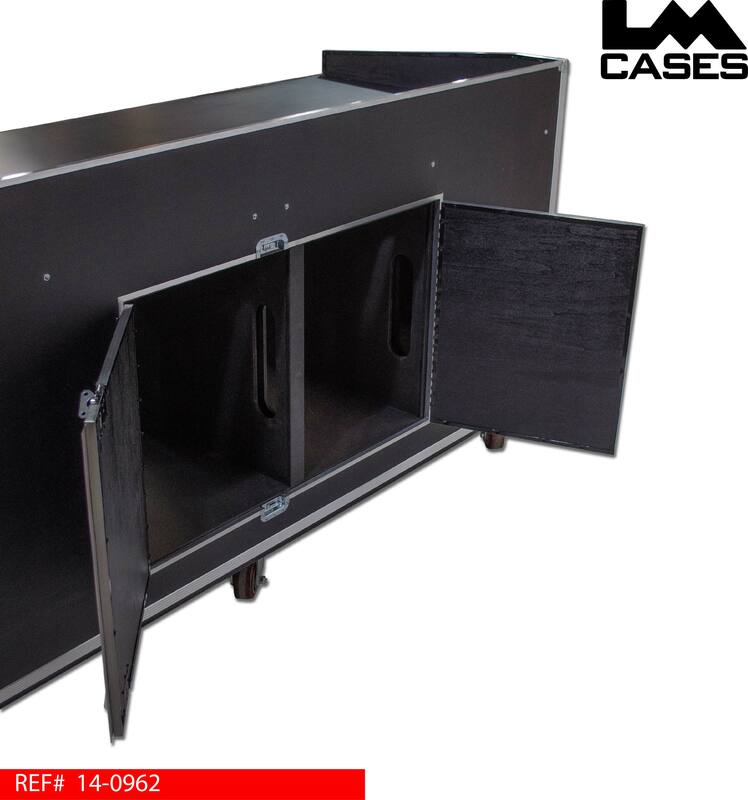 The workstation has a large desk surface laminated with black Formica to hold the consoles complete with 4 cable passages to all rack and storage sections. 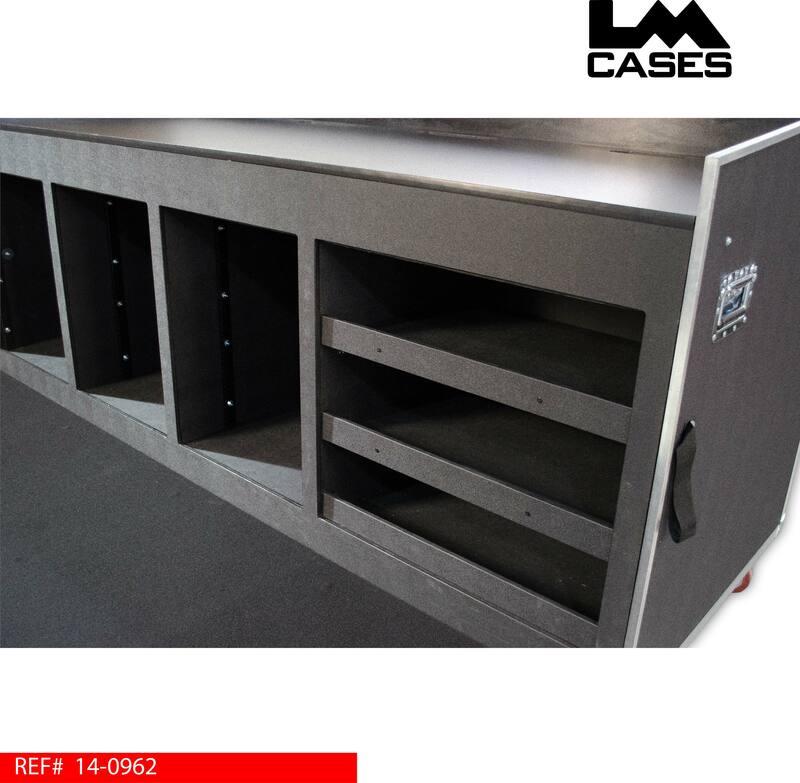 Below the work surface, are 3 - 14RU shock mounted racks: the far left rack is designed to hold rack drawers, the middle and far right rack are designed to hold equipment and feature a 6" rail recess to keep gear safe and allow operators to sit behind the work surface. 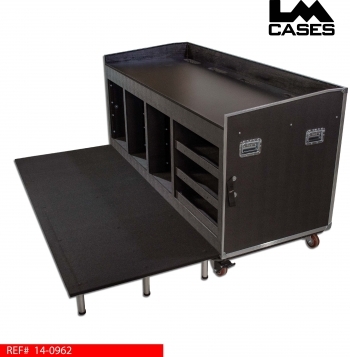 The far right of the case features 3 shelves for general storage. 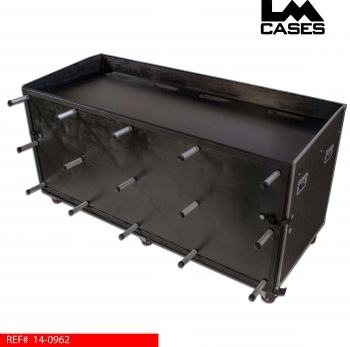 The front of the case has a custom fascia piece that covers all shock mounting foam and hardware to provide a clean look. 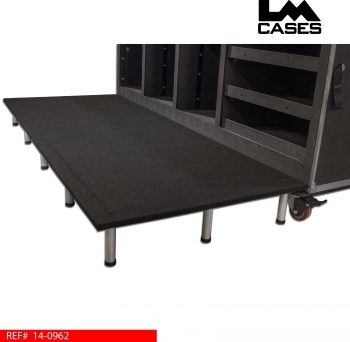 The most notable feature on the case is the standing platform: This 94.5" wide by 38.5" deep platform allows users to sit and stand 8" above ground level to create a full portable platform that sits above audience members for a clearer view. The platform is constructed out of 3/4" Baltic Birch and is supported by an aluminum outer frame. It is mounted on hinges allowing it to fold up and act as a front lid during transport to the storage closet. 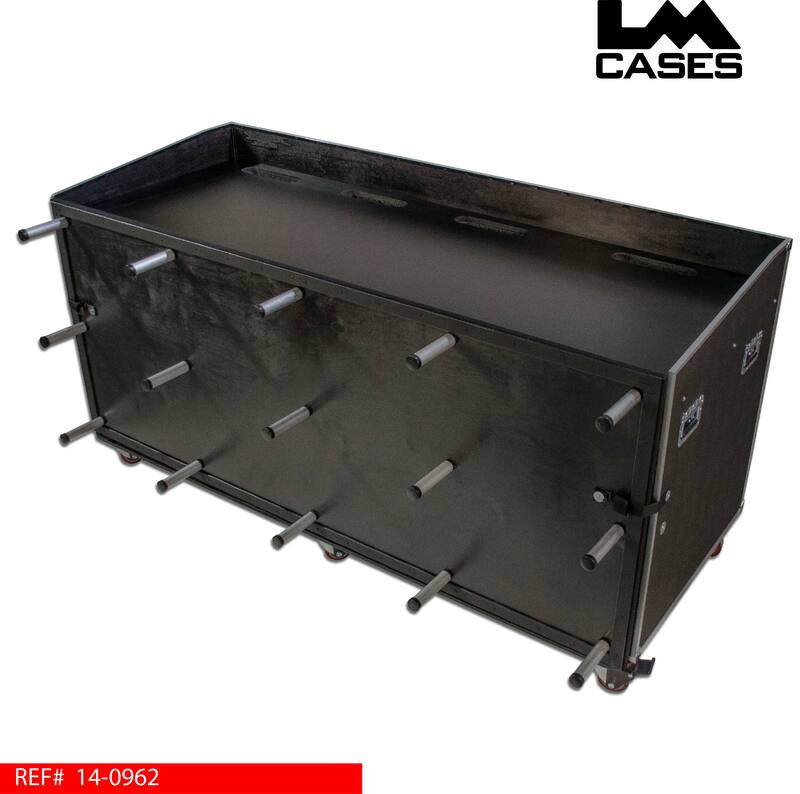 The exterior case is built out of 1/2" plywood laminated with black ABS plastic and features deep recessed handles, 4" x 2" Colson HD casters and a large rear trap door to access the rack section. Its OD dims are 96" wide by 48" tall by 44" deep with the platform lifted and secured. Special thanks to Advanced Lighting & Sound for a great project!